I just received an earthquake alert from the United Nations. My comments are in italics. See the email below. The UN provided some of the data; however, they state that they leave the interpretation of the data, to an expert. I am providing that expertise. There will be buildings collapsing from earthquake waves, landslides, rockslides, avalanches, floods, mudslides and various other calamities depending upon the altitude, the slope, temperature and most importantly which side of the mountains you are located. This will be a devastating earthquake with minimal possibilities of mitigation and/or management; due to terrain, geo-political concerns, lack of access and the sheer danger caused by aftershocks. Many remote areas will receive no help. The most important thing to know is simple: The population on the earthquake source side (epicenter) of the mountain will be devastated. The population on the other side of the mountain will be protected from the earthquake waves, by the mountains. Do you know which population areas are on the earthquake source side (epicenter) of the mountain? This is where ALL rescue and disaster mitigation resources need to focus. ARTI/doug copp have had a long history (10 years) of helping to train rescue/disaster mitigation and population survival methods, to Nepal. We have put resources in place; before, this earthquake occurred. Whether international humanitarian aid is needed must be decided by an expert. 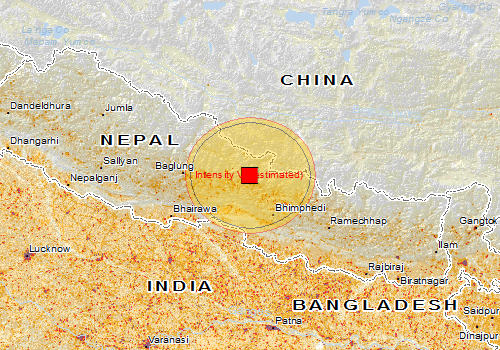 The earthquake happened in Nepal, Zone of Gandaki (population 1,364,467). The nearest places are Ku-la-ko (11km), Olang (11km), and Kathmandu (770000 people , 81km). The following vulnerable infrastructure is nearby and may be affected. The nearest hydrodams are Kulekhani (81km). The nearest protected areas are Manaslu (11km). For logistics, the following access points are nearby. The nearest airports are Gorkha (runway 3600ft, 34km), Mountain (63km), and Bharatpur (runway 3800ft, 68km). There are no known ports nearby. The maximum altitude nearby is 7700m. The area has steep slopes (up to 110 percent) and may be susceptible to landslides. The approximate distance within which light damage may occur is 109km (equivalent to Modified Mercalli Index IV). The population near the earthquake is shown in the table below. While we try everything to ensure accuracy, this information is purely indicative and should not be used for any decision making without alternate sources of information. The JRC is not responsible for any damage or loss resulting from the use of the information presented on this website. Please refer to the GDACS website for subscribing or unsubscribing from the earthquake alert email or SMS service. OCHA JRC UNOSAT Email created automatically at 25 Apr 2015 06:21 UTC. Reproduction authorised provided the source is acknowledged.